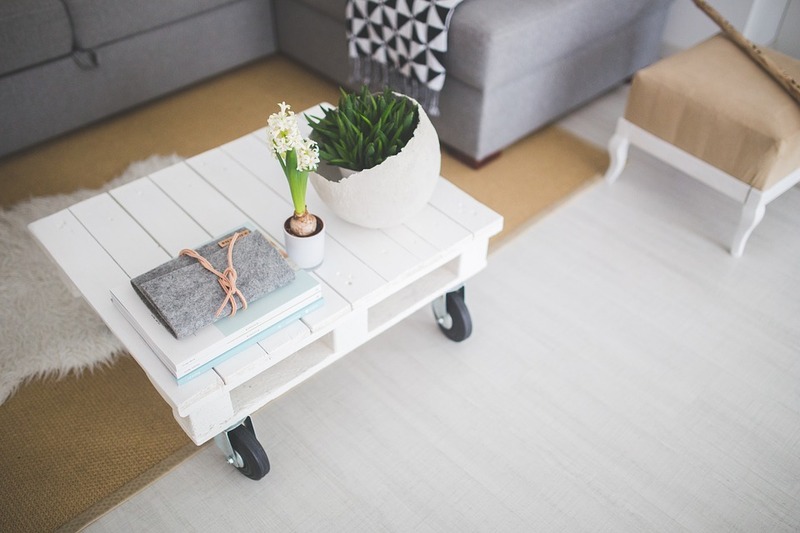 Try to overlook the small space of your condo by focusing on its positive feature. One of them is that you will decorate it much cheaper and faster than the bigger apartment. Think of it as your canvas that you can play it. While your apartment may be small, it doesn’t seem that it has to look like that. There are great tips for decorating a small apartment that can make it visually bigger and cozier. With the right guidance, you can create the living space of your dreams. What qualifies as a small apartment? The concept of a small apartment varies greatly. What is small for one person, it will be the palace to somebody else. While there isn’t official legislation that defines what size of the apartment is considered to be small, we can make a general conclusion based on the data and statistic. If we compare cross-country data, the small apartment will be condos between the average of the lower and the upper limit. It is safe to say that in the USA, the small condos are the ones that have between 250 and 550 square feet or less. When it comes to space, the studio apartments and one-bedroom condos are considered as small apartment units. 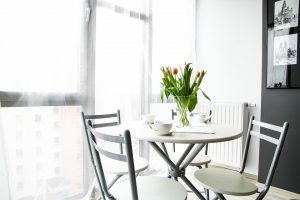 Maybe your financial situation is forcing you to choose to rent or buy a smaller apartment, but that doesn’t mean that the limited space should make you unhappy. In fact, smaller condos actually have a big number of advantages. It’s up to you to focus on them and make them work to your benefit. Affordability – The smaller condos are cheaper to rent or buy. The more square footage that the apartment has, the more expensive it will be. Of course, the location has a great impact on the price of the home. The studio apartment in Manhattan will cost like a two-bedroom condo in Quince for example. Cheaper utilities – In the smaller living space, you will use less electricity, water, and heat. That will decrease your monthly utility bills immensely. It is easier to clean – The less space, the quicker you will clean it. Small living spaces are making cleaning after the redecoration a piece of cake. You won’t go crazy on the shopping frenzy – Lack of the storage space will keep you from over-shopping. It is forcing you to be neat – When you don’t have a large living space, it’s more likely to purge clutter when you can’t hide it away. Decorating a smaller apartment is much easier and cheaper – The less space that you have to fulfill, the less furniture you will need to buy. Smaller apartments are a huge hit in the last decades. They are selling and renting much quicker than the bigger ones. The needs and desires of the new generations are responsible for that trend. Millennials and young professionals, to be exact. As the new emerging power in the real estate business, their demands are more different. Since they like to be in the center of the happenings, they will rather opt out for the studio apartment in the hip neighborhood than the house in the suburbs. They prefer to spend money and time on travel and leisure, not on the big utility bills and cleaning a home for hours. Also, when you have a small apartment it is easier to decorate your home on a tight budget. No matter if you are the owner of your home or you are renting it – everybody should in the nicely decorated space. 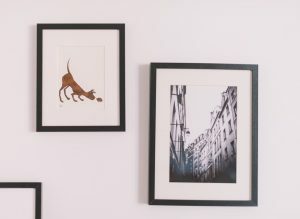 You should decorate your rented apartment like it’s your own. At the end of the lease, your decoration will go with you to your new home, so you have nothing to lose. With small apartments being so trendy these days, there are a lot of decorating tips that you can use. The ones that make your small living space to seem bigger than it really is are the most crucial ones. If you wish that your smaller apartment look bigger, paint your walls in white. This paint will instantly make any room to seem larger than it actually is. It also brightens the space and makes it look neater. If you think that white walls are boring, fear not. It is a great canvas to decorate with the items to your liking. Art pieces, posters, interesting curtains, and wall details will stand out on the white background and make a much bigger impression. While your walls should be white, you can play with the bright colors in other aspects of decorating a small apartment. 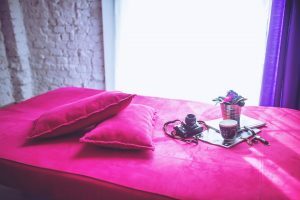 While bright or dark colors of the walls can overwhelm a small space, a small splash of vivacious color throughout an otherwise white or neutral space add style, personality, and energy. It is a proven fact that colors have a great effect on people mood, especially the bright ones. The furniture or the kitchen elements in some joyful color can really make your apartment to pop. Natural light is very important to small living spaces. One of the key features of decorating a small apartment is to take advantage of your windows. Natural light is creating an airy, spacious feel in almost any space, so expose your windows as much as possible. Don’t suffocate them with heavy curtains and don’t over clutter the window shelf. If you can’t live without the curtains, then choose the light, transparent ones. Using decorative lighting is a great tip for decorating a small apartment. If you don’t have enough space for some artistic stand lamp, then use your ceiling. You can make a big statement and add style to your living space by choosing the interesting ceiling light. Still, don’t forget to keep your fixture proportions in mind. An oversized sofa in a tiny apartment is the biggest mistake that you can make when decorating a small apartment. It will make your apartment to seem smaller than it actually is. When you are going to shop for furniture, always take measurements of your home and keep them in mind. And whatever you want to remove from your home, you can use quality packages which you can buy, or borrow from a local grocery store, etc. When it comes to furnishing smaller living spaces, keeping it on a smaller scale while still being comfortable and stylish is the smartest decision.